The Crimson Commander Mouse is a breed of mouse found in the Fiery Warpath location during Wave One, Wave Two and Wave Three. They are not known to drop any loot. The Crimson Commander carries its Warmonger's orders into battle. The strategy of the entire war is entrusted to these mice. Defeating them could turn the tide of the battle. Crimson Commander mice have been found to be especially attracted to SUPER|brie+ cheese. By capturing a Crimson Commander Mouse I demoralized the remaining mice in this wave! My current streak was x.
x of each mouse have retreated! 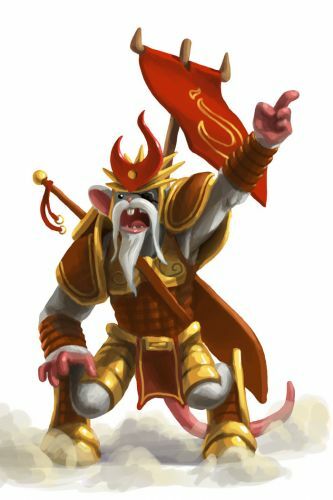 Catching a Crimson Commander Mouse, particularly during a streak of unbroken catches of a specific Marching Flame class or unit (Archer, Scout, Warrior, Cavalry, Mage or Artillery), will help to reduce the remaining quantities of mice that require defeating in that current Wave. Hunters have the option of arming Warpath Commander's Charms or Super Warpath Commander's Charms to help increase the likelihood of encountering a Crimson Commander Mouse. During Wave One, Crimson Commander Mice begin to retreat when there are 10 mice remaining in the troops to be defeated. During Wave Two, Crimson Commander Mice begin to retreat when there are 18 mice remaining in the troops to be defeated. During Wave Three, Crimson Commander Mice begin to retreat when there are 26 mice remaining in the troops to be defeated. The Crimson Commander Mouse drops the Warpath Egg during the annual Spring Egg Hunt. Crimson Commander Mice were introduced on 22 March 2011 with the release of the Sandtail Desert region. During the Spring Egg Hunt 2011, Crimson Commander Mice began dropping a bonus Warpath Egg as loot for hunters who had obtained the Rocket Rabbit Mallet. They dropped the same loot the following year during the Spring Egg Hunt 2012 event for hunters who had obtained the Eggscavator. This page was last edited on 27 January 2019, at 09:45.